Cucumber Lemon Orzo Salad makes a wonderful light lunch for the hopefully coming hot days. It is still not like a regular summer here even though we are in the middle of June. How is it in your area? If you’ve already welcomed the so much missed warmer or even hot days, you mut be in need of light dishes like this. Light, simple, tasty. 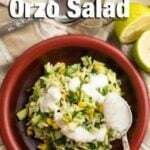 Orzo pasta is combined with cucumber, corn, herbs and lemon juice and topped with an amazing dressing with yogurt and fresh mint. Refreshing enough to beat the heat. 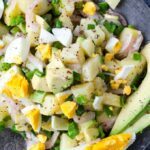 If you love barbecue parties but don’t have an idea about what to serve as a side and if you haven’t seen our Tangy Avocado Quinoa Salad yet, this Cucumber Lemon Orzo Salad is the answer you’re looking for. Besides being a wonderful vegetarian meal, this salad can go perfectly with anything. Pair it with chicken, beef, pork or even with fish; you will love it! It is like the combination of two side dishes. Orzo could be served as it is just like rice, but when it is combined with a tangy green salad, this is what you will end up with. This Cucumber Lemon Orzo Salad is so tangy that you feel it in every bite. This is the first thing that makes this salad so tasty. I can’t think of orzo without that lemony flavor. To complement this flavor, I top the salad with a yogurt dressing which is one of my basic salad dressings. Greek yogurt, fresh mint and salt are mixed well in a bowl and use it on any salad you like. This refreshing salad makes anything even tastier and you will inevitably want to eat more! The main ingredients of this Cucumber Lemon Orzo Salad are herbs, cucumber and lemon. Corn is completely optional, but I love to use it to give the salad a little sweetness and balance the flavors in it. Another thing I love about this salad is that you can make it ahead and keep in the fridge in an airtight container for up to 3 days. Serve it in a barbecue party, take it to a picnic or a potluck party or just open the fridge and snack on it whenever you crave for something savory and tangy. 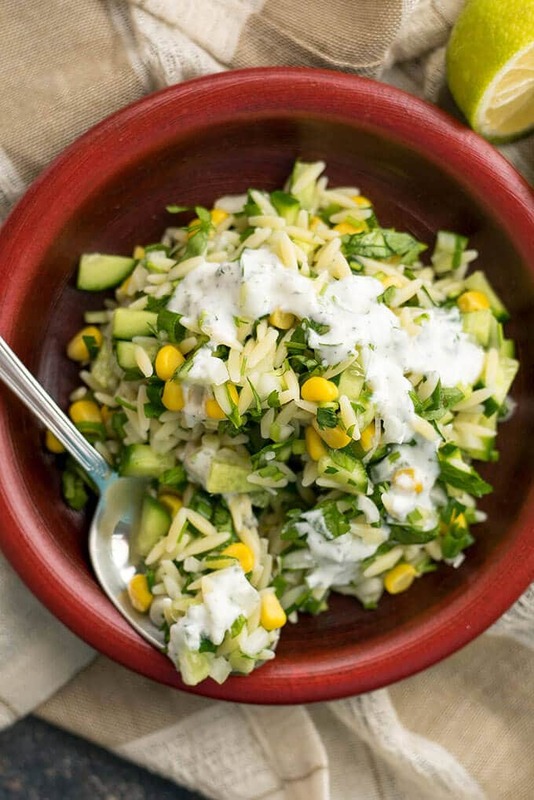 Tangy orzo salad with cucumber, herbs and corn drizzled with a wonderful yogurt dressing. Cook the orzo according to package directions. Drain and rinse with cold water. Let it completely cool. In a arge bowl, combine the orzo with the rest of the ingredients. In a small bowl, whisk together Greek yogurt, water, garlic, salt and minced fresh mint. Drizzle over the salad and serve immediately. If you are planning to make it ahead, don’t top it with the dressing. It’s better to prepare it right before serving the salad. Thank you Marla! Easy, healthy and great for hot summer days!